Why Do I Recommend Nuts to All My Patients? Walnuts seem to have the lowest omega-6/omega-3 fatty acid ratio of all the common nuts. That may make them the healthiest nut. The jury is still out. Macadamia nuts also have a good ratio. Paleo dieters focus on cutting out omega-6s and increasing omega-3s. 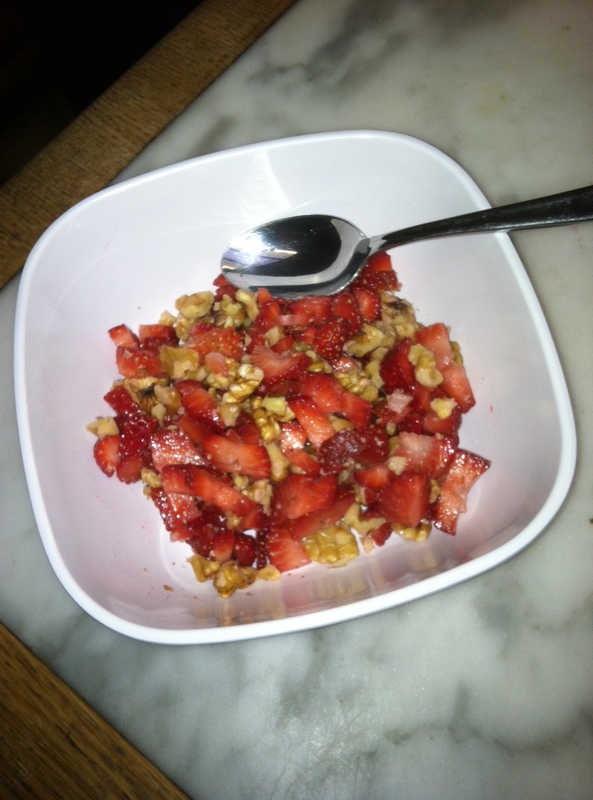 Julianne Taylor has a great post on how to do that with a variety of foods, not just nuts. My stepson came up with this one. Thanks, dude! If you think breakfast means eating out of a bowl, this one fits the bill. And talk about easy! Mix ingredients together in a bowl and enjoy eating with a spoon while your tablemates eat Neolithic Cheerios. prominent features: 80% of vitamin C RDA (recommended dietary allowance), 32% of RDA for phosphorus, 27% of RDA for iron, 25% of RDA for magnesium, 21% of RDA for vitamin B6, 19% of RDA for thiamine. It’s also particularly rich in copper and manganese. Nuts are a time-honored component of the Mediterranean diet and may contribute to the lower risk of cardiovascular disease associated with the diet. Regular nut consumption lowers total cholesterol and LDL (“bad cholesterol”) by 5 to 15%, which would tend to lower heart disease risk. Walnuts are particularly high in alpha-linolenic acid, an omega-3 fatty acid. The “dose” of walnuts in these studies was 1–2 ounces (28–56 g) daily. For good reason, nuts have a prominent role in both the Advanced Mediterranean Diet and Ketogenic Mediterranean Diet. I don’t know Bix, but he or she seems to base many of his/her nutrition opinions on scientific principles, which I appreciate. An article published December 8, 2008, by Bloomberg.com presents results of a recent scientific study in Spain that showed reduction in “metabolic syndrome” by the Mediterranean diet supplemented with nuts. CBSnews.com, Reuters, and others helped spread the news. The Bloomberg article was written by Nicole Ostrow. The scientific study at hand is part of the PREDIMED study being conducted in Spain. For this portion of the study, 1,224 participants at high risk for cardiovascular disease were randomized to follow a 1) low-fat diet (considered the control group), 2) Mediterranean diet plus 1 liter virgin olive oil per week, or 3) Mediterranean diet plus 30 gm daily of mixed nuts. Note that the nuts used in this study were walnuts, almonds, and hazelnuts. Half of all nuts were walnuts; a quarter of the nuts were almonds and a quarter were hazelnuts. Participants were 55-80 years old, and 61% had metabolic syndrome at baseline. Participants could eat all they wanted, and there was no increase in physical activity for any of the groups. Participants were given instructions at baseline and quarterly. After one year of intervention, the prevalence of metabolic syndrome was reduced by 14% in the Mediterranean diet plus nuts group compared to the control, low-fat diet group. The Mediterranean diet plus extra olive oil group reduced prevalence of metabolic syndrome by 7%, but this did not reach statistical significance (P=0.18). New cases of metabolic syndrome continued to develop at about the same rate in all three groups. I.e., incident rates were not significantly different. So, the lower prevalence of metabolic syndrome after one year reflected reversion or clearing of the syndrome in many people who had it at baseline. Compared to the control group, people in the nutty group were 70% more likely to resolve their metabolic syndrome. Individuals in the oily group were 30% more likely than controls to resolve the condition. A traditional Mediterranean diet enriched with nuts could be a useful tool in the management of the metabolic syndrome. Thirty grams (daily) of nuts is a decent-sized snack of about 180 calories. Thirty grams of almonds formed a heap in the palm of my hand, not touching my fingers. This is more than the “two tablespoons” reported by CBSnews.com December 9. If you have metabolic syndrome, you might want to try reversing it with all the usual methods (e.g., lose excess fat weight, exercise more) along with a traditional Mediterranean diet enriched with 30 gm of mixed nuts daily. As usual, check with your personal healthcare provider first. Be aware that many of them won’t know about this study. The puzzling thing to me is: If the Mediterranean diet plus extra nuts is so effective in reversing metabolic syndrome, why didn’t that study cohort see fewer new cases of metabolic syndrome? Additional reference: Salas-Salvado, Jordi, et al. Effect of a Mediterranean Diet Supplemented With Nuts on Metabolic Syndrome Status: One-Year Results of the PREDIMED Randomized Trial. Archives of Internal Medicine, 168 (2008): 2,449-2,458.